CLEVELAND (AP) — Edwin Encarnacion hit an eighth-inning grand slam, helping the Cleveland Indians rout the Detroit Tigers 12-2 on Sunday for their season-high seventh straight win. Francisco Lindor, Jose Ramirez and Jason Kipnis also connected for Cleveland, which outscored Detroit 26-3 in the three-game sweep. Ramirez finished with three hits, extending his streak of reaching base to 31 consecutive games. Adam Plutko (4-1) pitched six innings of two-run ball, becoming the second rookie starter to beat the Tigers in the series. Shane Bieber pitched seven innings in Friday night’s 12-0 win. Tigers starter Matthew Boyd (4-6) allowed a season-high six runs in three-plus innings in his shortest outing of the season. Detroit has lost five straight overall and is 3-10 against Cleveland this season. The Indians grabbed control with four runs in the first two innings. Michael Brantley hit a two-run single in the second. Lindor added a two-run homer in the fourth. He hit solo home runs Friday and Saturday, and is second on the team with 19 homers this season. Lindor also led off the first with a double and scored on Encarnacion’s double to the left field corner. Encarnacion nearly flipped over on his head-first dive into the bag, but beat the throw. Niko Goodrum and James McCann had RBI singles for Detroit in the fourth. Plutko worked out of a jam in the first. Leonys Martin led off with a single to center. First baseman Yonder Alonso then fielded Jeimer Candelario’s ground ball near the bag. Instead of stepping on the base for an easy out, Alonso threw to second but Martin was safe. Plutko bailed out his defense by retiring Nicholas Castellanos, Victor Martinez and Goodrum on flyouts. The Tigers have lost all nine games they have played in the state of Ohio this season. 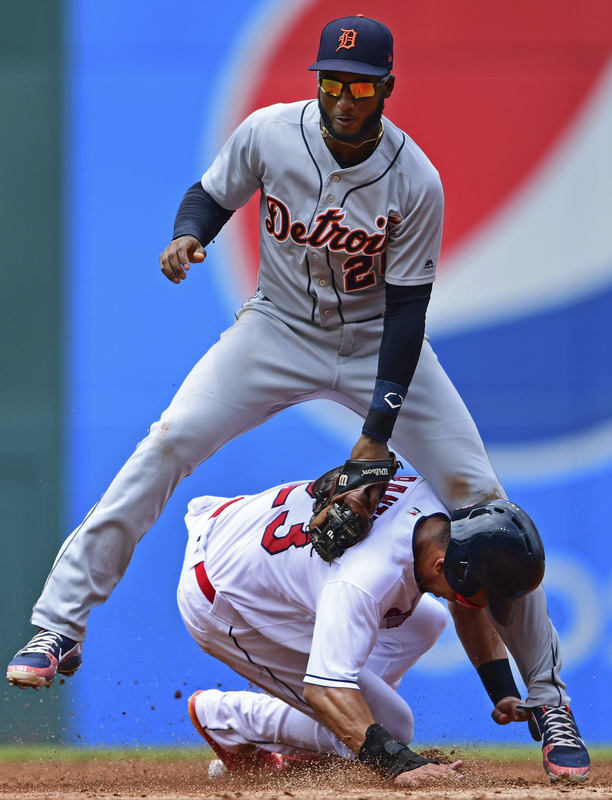 Detroit was swept in a four-game series at Progressive Field in April. The Tigers lost both games in Cincinnati this week before heading north. The Tigers return to Cleveland in September. Tigers: RHP Drew VerHagen (broken nose) will not resume baseball activities for two weeks after being struck on the face with a throw from shortstop Jose Iglesias while covering first base Tuesday in Cincinnati. Indians: RHP Carlos Carrasco will throw bullpen sessions this week to test his bruised elbow. He was struck by a line drive hit by Minnesota’s Joe Mauer on June 16. Tigers: RHP Jordan Zimmermann (2-0, 4.95 ERA) takes on Oakland at Comerica Park on Monday in the opener of a four-game series. Indians: RHP Mike Clevinger (6-2, 3.00 ERA) pitches the series opener in St. Louis on Monday. RHP John Gant (1-2, 4.39 ERA) starts for the Cardinals.